Week 6, we are at the end of the first half of Class 1!! 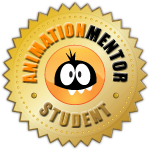 This week assignment is about overlapping, once again one of the principles of animation. It was cool to make this animation because now I begin to use interaction with other animated props! Pendulum from Alex Ronco on Vimeo.